LinMot servo drives are compact positioning controllers with one or more power elements for actuating motors, as well as an intelligent control element with integrated closed-loop position control. The control element handles all of the control and monitoring functions related to the drive. It can use positions defined directly by the overall system controller, or execute internally saved motion profiles using simple analog or digital signals. The wide variety of servo drive products makes it possible to quickly implement simple applications with two end positions as well as complex, high-precision, multi-axis applications with synchronization to an electronic primary shaft. LinMot drives cover the full range of power ratings for actuating compact mini-drives with low power at low voltage levels from 24-72 VDC, up to high-power servo motors with direct drive feeds from a three-phase grid of up to 3×480 VAC. Connection to an upper-level controller can be made via analog, digital, or serial interfaces, fieldbuses, or ETHERNET. The wide range of fieldbus interfaces and protocols makes LinMot servo drives easy to integrate with any controller, whether a PLC, and industrial PC, or a proprietary controller. LinMot provides customers with extensive functional building blocks and example programs to support trouble-free integration. The functional building blocks can be used to execute functions such as drive parameterization and configuration directly from the controller, in addition to standard motion commands. Complete drive configuration of the associated axis is thus saved in the controller. In case of service or replacement, this makes it possible to automatically detect and parameterize the drive via the bus. This eliminates the need for time-consuming manual configuration of the drives in case of a fault. Profibus drives were developed for use with Siemens controllers. 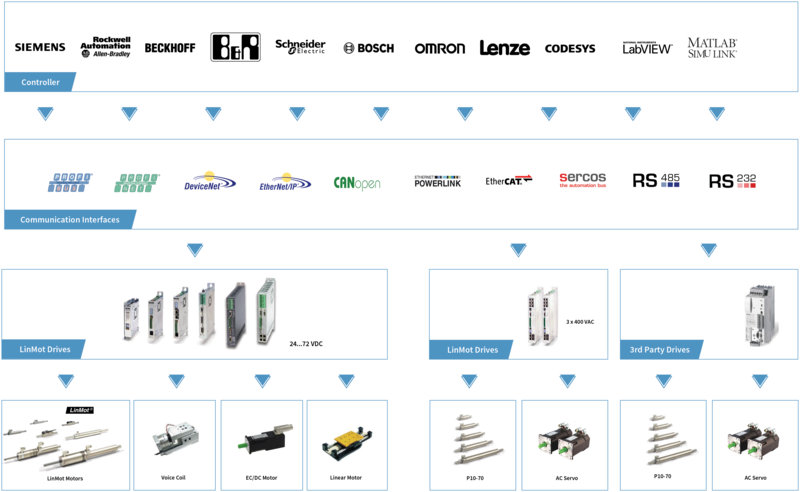 For new applications, the use of ProfiNet is recommended. EtherCAT drives were developed for use with controllers from various manufacturers who offer this standardized bus. Ethernet IP drives were developed for use with Rockwell controllers. LinMot is an official Rockwell Encompass Partner and bus compatibility is ODVA certified. DeviceNet drives were developed for use with Rockwell controllers. For new applications, the use of Ethernet IP is recommended. LinMot is an official Rockwell Encompass Partner. Sercos III drives were developed for use with controllers from various manufacturers who offer this standardized drive bus. Powerlink drives were developed for use with B&R controllers. LinUDP was developed for controlling LinMot drives via a PC Ethernet interface. This allows them to be easily integrated in LabView, Visual Basic, Excel, and other Windows-based programs. CANopen drives were developed for use with various controllers that offer this standardized and prevalent bus. LinRS was developed for controlling LinMot drives via RS232 or RS485 interfaces. This allows them to be easily integrated in LabView, Visual Basic, Excel, and other Windows-based programs. As an alternative, Ethernet drives with LinUDP are available for new applications. Due to their highly dynamic performance, long service life, and the ability to move to several positions, LinMot linear motors are often used as replacements for pneumatic cylinders. Various end positions can be saved in the drive and are invoked via digital signals, just like a pneumatic cylinder. When the end position has been reached, this is indicated by a digital in-position output signal to the upper-level controller. The velocity and acceleration can be freely configured for each motion. Standard applications can be implemented with simple point-to-point motions actuated by means of fieldbuses or an Ethernet interface. The position, velocity, and acceleration can be freely configured and defined via the bus. Complex or interdependent motions can be saved in the form of motion profiles on the drive, and started by means of digital trigger signals or the bus connection. Complex applications with synchronization to a primary or master shaft can be implemented without a problem using the integrate Master Encoder interface. Travel curves from an upper-level NC controller can be executed using the +/-10V interface or streaming mode (PVT, PV). Together with a high-resolution external position sensor, even high-precision positioning tasks in the range of µm can be handled. In addition to linear motors, LinMot servo drives can be used to actuate rotary servo motors or any 1/2/3 phase actuators. Especially in assembly automation and feeder applications, small and lightweight brushless DC motors (EC motors) are often used to rotate a gripper about the Z axis. The flexibility of servo drives allows such rotary motors to be integrated into the existing control concept in the same simple manner as linear motors. In multi-axis or composite operation, the axes can be controlled individually or synchronized to a primary or master shaft using the Master Encoder interface. For complex designs, multiple axes can be synchronized using Master Booster or Master Gantry mode. This allows easy implementation of portal designs with two synchronized axes that are controlled as a single axis by the upper-level controller. Plug and play motors are supported by the C1200 / C1100 / E1200 / E1400. The servo drive reads the values when it boots up, and sets the parameters accordingly. This automatic device recognition eliminates the need to select the required model parameters from an extensive library. The motor can be set in motion immediately after installing and connecting the cable. Without needing to boot up the configuration software, initial commands can be sent by the PLC controller immediately. The most common LinMot drives are approved as components under the UL 508C regulation for variable-frequency controllers and with this label they meet the requirements for the US and Canadian markets. In order to prevent unintended startup, the model C1200 / C1100 / E1200 / E1400 drives have an STO function to safely shut off the output stage. The drive cannot produce any more force when shut off using the “Safe Torque Off” function.